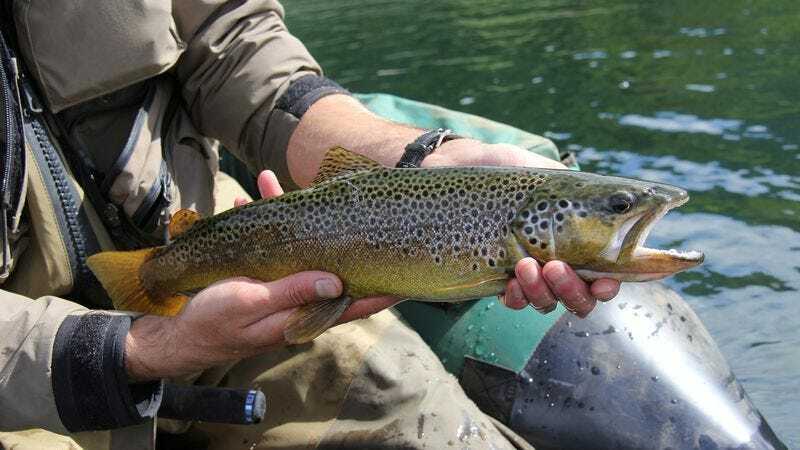 KNOX, ND—Saying he had no desire to cause any animal unnecessary suffering, compassionate fisherman Dan Larson reportedly said Monday that he didn’t have the heart to throw a trout back into an incredibly polluted lake. “I just fish for fun and relaxation, not to hurt anything, and it’d be cruel to toss him back in there with all that garbage,” said Larson, adding that he simply couldn’t bear the thought of returning the fish to the lake where it was likely to choke to death on a plastic wrapper or get snagged in a roll of rusted metal wire, if it wasn’t already slowly being killed by runoff from the abandoned chemical drums floating in the water. “Honestly, he’d even be better off mounted on my basement wall than having to spend another day in that disgusting pool of filth. Poor guy—look at him.” At press time, Larson had beaten the fish with a paddle until the animal’s gasping finally stopped.